Taking my break last winter I had quite some free time to float around and recap. So I also used my time to write for shareable.net the article Every Guest a Host on what this casa is all about: What is it that makes me wanna do this, why do people like it so much, and what are the little things that make it a challenge to live here? But more important, how do I find the right words to actually describe something that is so fluid, so creative and so dynamic? Is it possible? Well, let's say I got pretty far with this article and that for a large part it sums up at least how it feels. 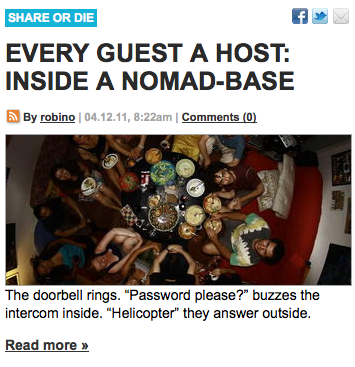 Also, this article is part of a forth-coming book about "Youth During Recession Time", called "Share or Die". It is likely to be only an e-book but thankfully we have a machine here in Amsterdam (the Espresso Book Machine) with which we can self-publish our books. Submitted by valentina on Wed, 13/04/2011 - 23:59. Great article. Happy that Casa is in Spring time again :). Submitted by robino on Sun, 17/04/2011 - 15:58. Submitted by helicopter on Thu, 21/04/2011 - 10:03.